The Treaty of Paris was the official peace treaty between the United States and Britain that ended the American Revolutionary War. It was signed on September 3, 1783. The Congress of the Confederation ratified the treaty on January 14, 1784. King George III ratified the treaty on April 9, 1784. This was five weeks after the deadline, but nobody complained. The treaty was negotiated in the city of Paris, France. That's where it gets its name. There were three important Americans in France to negotiate the treaty for the United States: John Adams, Benjamin Franklin, and John Jay. David Hartley, a member of the British Parliament, represented the British and King George III. The document was signed at the Hotel d'York, where David Hartley was staying. After the British Army surrendered at the Battle of Yorktown it still took a long time for an agreement between Britain and the United States to be signed. It was around a year and a half later that King George finally ratified the treaty! The first point, and most important to the Americans, was that Britain recognize the Thirteen Colonies to be free and independent states. That Britain no longer had any claim on the land or government. The second major point was that the boundaries of the United States allowed for western expansion. This would prove important later as the US continued to grow west all the way to the Pacific Ocean. Other points in the treaty had to do with agreements on fishing rights, debts, prisoners of war, access to the Mississippi River, and the property of Loyalists. Both sides wanted to protect their citizen's rights and possessions. Each of the points is called an article. Today the only article that is still in force is article 1, which recognizes the United States as an independent country. The three Americans, Adams, Franklin, and Jay signed their names in alphabetical order. 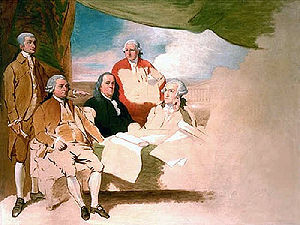 Benjamin West tried to paint a portrait of the treaty negotiations. The left side with the Americans was finished, but the right side never was completed as the British refused to pose. There were also treaties that involved other nations involved in the war such as France, the Dutch Republic, and Spain. Spain received Florida as part of its treaty. The start of the treaty says its goal is to "secure to both perpetual peace and harmony".